BRISTOL, Va. (CNS) — It has taken time for Nicole Hughes to get settled back into her routine at St. Anne Catholic School in Bristol. While a new school year brings with it fresh beginnings, eager faces and excitement, this school year the English teacher has felt an inescapable absence as she walks the halls among the elementary students, two of whom are her daughters. Her youngest child, Levi, was to have started pre-K this year next to her daughter, who is in kindergarten. She looked forward to being in the same building with her three children until they completed eighth grade at St. Anne and graduated to high school. But those plans were tragically altered June 10 for the Hugheses during a family vacation at Fort Morgan Beach in Alabama. 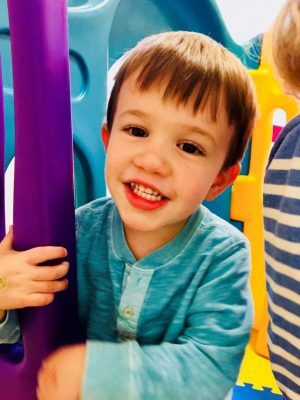 In what Nicole Hughes described as a split second, 3-year-old Levi drowned in the pool of the beach house the Hughes family was sharing with the families of five close friends. As the Hugheses try to come to terms with Levi’s death, the family has been leaning on their faith, and Levi’s mother is making it her personal mission to make all parents aware of water safety and the ever-present danger of drowning. Levi’s death and Nicole’s response to it are receiving international attention as she talks openly about the unlikely drowning and how it might have been prevented. Contributing to Levi’s story is a similar tragedy that occurred on the same day he drowned. Olympic gold medalist snow skier Bode Miller and his wife, Morgan Beck Miller, lost their 19-month-old daughter, Emeline Grier, to drowning in a pool near their Orange County, California, home. Now, Nicole and Morgan Beck Miller have joined their efforts to raise awareness for water safety and drowning prevention, and the need for parents to always make sure their children are supervised around water. Their stories have been told on television, in newspapers, and via social media across the United States and in other countries. National news outlets like CBS, NBC’s “Today Show,” Fox News, People Magazine, and Yahoo! News have told their stories. And Nicole has launched a website, www.levislegacy.com, to promote “Water Guardians,” a simple system of continual oversight of children around water where individuals alternate as the designated water guardian. The designated individuals wear a lanyard or tag identifying them as the water guardian. Each tag is the size of a credit card and can be personalized. The Water Guardians nonprofit program has been endorsed by the American Lifeguard Association. “I am grateful, humbled, and honored to be part of this national platform. I have always believed in shared experiences, which is why I became a teacher. Part of this is now my story. I wish it wasn’t, but hopefully by sharing this it will help others,” Nicole said in response to a question, fighting back tears as she described Levi. Nicole still is in disbelief that her young son slipped through their considerable safeguards to quickly — and quietly — reach the swimming pool. She vividly recalls the instant he left her side to join his playmates on the couch to watch television after dinner. The 12 adults and 17 children were waiting until after dark to go crab hunting along the beach. Nicole had just split a brownie with Levi as he scampered off toward the couch. But only moments later, she glimpsed over the balcony to make sure none of the children were by the pool when she saw Levi at the bottom of the deep end. As she screamed and darted toward the pool, a family friend jumped from the second-floor balcony into the pool. She then jumped in with the other half of the brownie still in her mouth and helped pull him out. 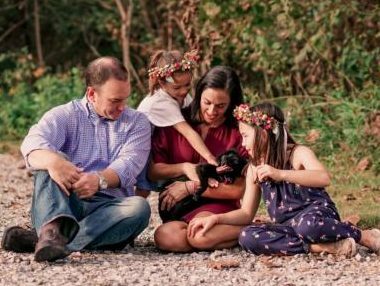 Her husband, an anesthesiologist, was joined by five other physician friends on the vacation trip in trying to resuscitate Levi, who was airlifted to Mobile Children’s Hospital. He never regained consciousness. Water safety has always been at the forefront of their concerns, which also have included car-seat safety, front- and back-door safety, and even elevator safety (making sure the children never get on an elevator alone). “I’m clinging to faith blindly. I’m hoping to come out on the other side of this with a stronger faith and belief that the universe is good. Sometimes that seems doubtful,” Nicole told The East Tennessee Catholic, newspaper of the Diocese of Knoxville. The family lives in Blountville, Tennessee, in the Knoxville Diocese. Dr. Hughes’ practice is in Bristol, Tennessee, right next to Bristol, Virginia. As she struggles with Levi’s death, Nicole is frustrated by the lack of widely disseminated information on drowning and its casual acceptance as a killer of children and adults. Since June 10, she has learned that the leading cause of death, aside from congenital disorders, in children ages 1 to 4 is drowning. “There is a disconnect between what people think drowning is and what drowning actually is. No one is talking about drowning even though it happens frequently,” she noted. Nicole said she is receiving an outpouring of support through messages from all over the world. Brewer is editor of The East Tennessee Catholic, newspaper of the Diocese of Knoxville.